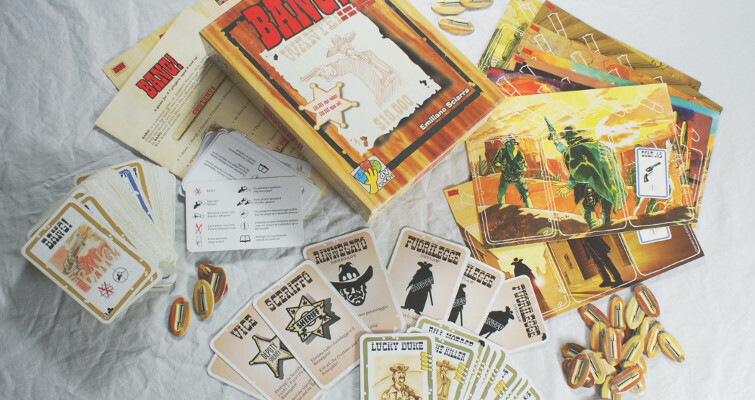 Bang is a western-themed party game with a surprising amount of strategy for its category. This popular card game is about bluffing, deduction, and most importantly – having fun! In Bang! players are given a secret role to determine which side of the law they’ll be fighting for, all with the purpose of killing the opposing teams. Will you be the all-powerful sheriff, his right-hand man, a fearless outlaw, or perhaps the renegade, fighting for your own cause? 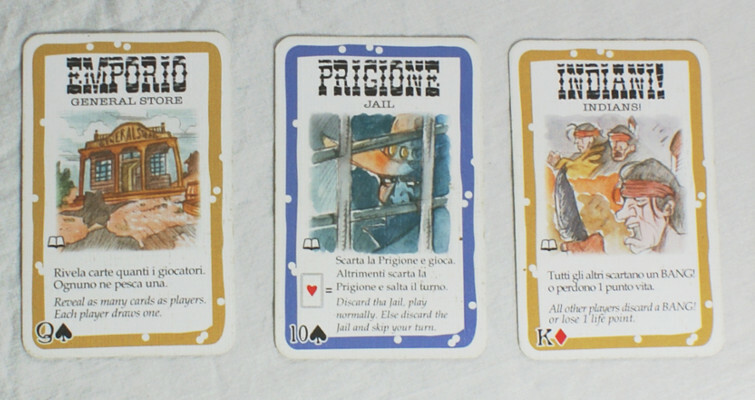 In a typical 5-player game there will be 1 sheriff, 1 vice-sheriff, 2 outlaws, and 1 renegade. The sheriff and vice sheriff win if the outlaws and renegade are killed. The outlaws win if the sheriff is killed, and the renegade wins if he and the sheriff are the last 2 players left and the sheriff is killed. In games with more players an additional outlaw and vice sheriff/deputy are added. The person who gets the sheriff role must reveal their identity. All remaining players must keep their identity a secret. All players also receive a non-hidden character with passive abilities, which can be used during gameplay. Player interaction is done via cards. 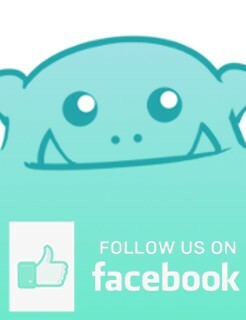 The deck mainly contains ways to attack other players and defend against attacks, such as Bang! cards (gunshots) and Missed cards (evading gunfire). Other note-worthy cards are healing cards, cards with weapons and cards with special effects. Players take turns to play cards and draw new ones. Players can only shoot at the players right next to them unless they have an increased shooting range, and may also only use 1 Bang! card per turn. These restrictions can make it difficult to eliminate enemies. You might not be able to reach the person you want to kill, and that person might suspect you and have range to be able to shoot you. If a player is unable to defend an attack they lose life point/s. Once out of life points that player is then eliminated from the game, and must at that point reveal their secret identity. As more players are eliminated it becomes easier to figure out who is who. The strategy a player follows will depend on the role they are given. For example, the renegade will want everyone but the sheriff dead first, so he could try to persuade the sheriff that he is the vice sheriff by shooting at anyone who shoots at the sheriff. If armed with a range to be able to reach the sheriff, but out of range for the sheriff to be able to shoot him, he could also choose to admit he’s a renegade to get the sheriff to kill off the outlaws first, as the sheriff would not be able to kill the renegade at that time anyway, and knows the renegade will not go for him until he is the last player. Bang can play with up to 7 players, which makes it an ideal choice for larger groups. One thing to be mindful of with Bang! is that it does have player elimination. It can happen that a player is killed off before they’ve even had their first turn, and as the game can take some time this means it might not be so much fun for those eliminated. This could be fixed with some house rules. For example, the sheriff is rarely the first one people go for, so if someone was killed off very quickly they could take the role of sheriff for the next game, or there could be a rule that for the first 1-2 rounds you can’t attack someone with only 1 remaining life point. 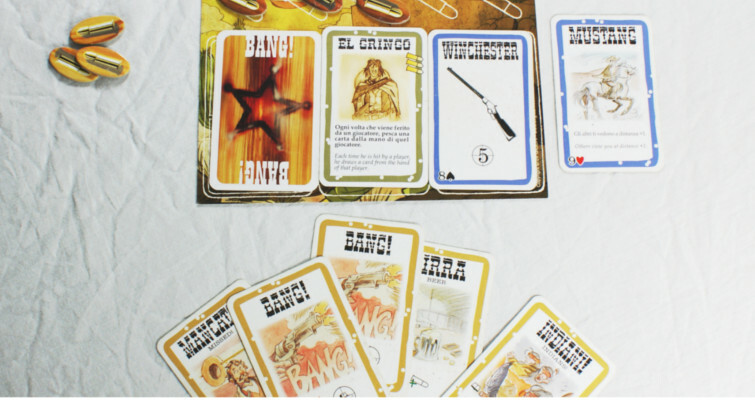 With the variation of roles and character cards, the element of bluffing and take-that element, Bang! has great replay value and is, with the right crowd, a fun experience.